June 2015: Pyrenees, Bearn, Pays Basque, Bassin d'Arcachon, Gironde, Charente-Maritime, Dordogne. Bikes: Flat-handlebar road bikes with 700CX28 tyres. Later retrofitted with climbing gears - made touring far more enjoyable in hilly areas. Preparation for flight: Remove pedals, turn handlebars sideways, tie up chain, lower saddle, and wrap frames in bubble wrap. At the airport we deflate the tyres. From Johannesburg we have them wrapped in plastic, but it is not necessary from Europe. Bike tools - no.15 spanner for pedals, allen key bike tool, chain lubricant. Spare tubes and puncture kit. Latex gloves to keep hands clean doing repairs. Luggage carried in panniers which weighed approx 10kg when packed. 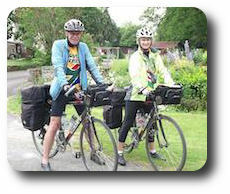 (Panniers bought overseas, as we couldn't find them for sale in South Africa) and click-on handlebar bags. Maps: Michelin Local series (yellow, or Carte Jaune) scale 1:150 000 or 1:175 000. Easily available everywhere in France, and more practical to us than the IGN cycling maps. Michelin Regional series maps (orange) in 1:200 000 scale have the same amount of detail as Local maps. They cover larger areas, so you will need fewer maps, but may need your glasses! For extensive trips, buy the A3 road atlas which has the entire country in 1:200 000. The paper is thinner than the large charts, but having the whole book was handy for trips over a couple of years. Map holders: home-made from plastic sleeves bought at the stationery shop and attached to the handlebar bags with velcro. Other: See our checklist, but special items include binoculars and pocket guide to European birds, some catering equipment and supplies - cutlery, small pair scissors, small cool-bag, salt and pepper, powdered sports drink (Game). Own shampoo and bath soap - many B&B's do not provide soap. Smartphone and European sim card for local calls. Trains: We take trains to our starting point, or for intermediate journeys to cover busy or less interesting sections. In Paris, the RER suburban train takes bikes in the end coaches marked with a bicycle. Note: the Metro doesn't. Many long-distance trains take bikes. Check the SNCF website. 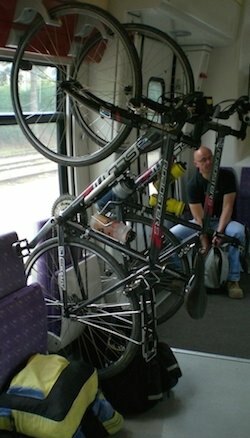 Even though some TER trains don't have the train symbol, the conductors turn a blind eye to us loading the bikes. The TER and regular Corail trains take bikes free, but Corail Teoz and TGV trains required a payment of €10 each. More TGVs now carry bikes. Conductors are helpful. At smaller stations, they helped load the bikes on and off the trains. One disastrous day, we inadvertently left one helmet, gloves and sunglasses on the platform. From the train, the conductor used his cellphone to phone the station, and arranged for it to be sent on the next train. It arrived, neatly labeled with the contents! Tip: Avoid train travel on Saturdays where possible. Trains get crowded - a large percentage of the population appears to travel. The bike area will probably be filled with luggage which you will have to move yourself in a mad scramble to get your bikes on board before the train moves off. Buses: We also took long-distance buses, both TER and private bus companies. The drivers were always happy for us to load the bikes into the luggage compartments underneath. Tip: Remove the pedals to make loading much easier. During the year, we decide which region to visit and work out a basic direction according to the weather (prevailing wind is westerly) and terrain (Tip - riding a river towards the source goes UPHILL). We plan the finer details during the trip on a daily basis. Despite certain regions being more highly recommended, we had some of our best days simply riding across the countryside, transiting from one area to another. We average 70 -80 km per day. We start about 9.00am, after breakfast and packing up, and usually get to our next B&B 5pm. Tip: If you are new to France, get to know the system of regions and departments. The regions are the larger provinces, divided into departments, and it is essential to know which one you are headed for to search for accommodation, etc. Tourist offices: When entering a new department, get hold of the 'carte touristique' which will list all the tourist offices. The size of each office is indicated by the number of stars. The bigger the office, the longer the opening hours, with the biggest ones being open on Sunday mornings. The tourist office is usually in the centre ville, and well signposted. Plan ahead by visiting their websites, Many have downloadable guides and accommodation lists to save on your device for when you don't find wifi. French tourist offices are fairly plentiful and provide excellent local maps and guides for the area. Mostly, the staff were helpful and friendly - we only experienced a couple of grumpy people. Tip: when asking for directions, from anyone: be alert for 'French Kilometres'. You may be told the distance to go, but as a rule of thumb, double it. We might be told that our chambre d'hote was one kilometre out of town, and five km later, just as we thought we were hopelessly lost, we would arrive. The language: It goes without saying that one cannot practically attempt a trip into the French countryside without knowing a few words of French. Our hosts, especially the older ones in the countryside, often did not have a word of English. Even if the chambres d'hotes advertised 'English spoken' we surmised the more venerable hosts last spoke English during high school. Despite the communication barrier, we were in general blown away by the friendliness and helpfulness of French people. Many people we met went out of their way to help us when we needed it. Previously, we relied heavily on the 'Gites de France' network of chambres d'hotes. Each region publishes a book or map, although this is limiting if the book only covers one department, which you could cycle through in a day. We would consult the guide and (before we spoke enough French) ask our hosts to phone ahead for us. Nowadays, many owners are delisting due to the cost. Therefore many chambres d'hotes are only listed with the local office du tourisme. Some OdT sites offer a downloadable pdf listing their accommodation which is handy if you were going somewhere with no wifi. Otherwise we would go to the OdT on arrival and ask them to help us find accommodation. The smaller the town, the more helpful. In the bigger ones they might request payment of 1 or 2 € to phone. Most chambres d'hotes offer wifi now, which allows you to plan your next stop online. Google maps - Tip: Save your Google map for offline viewing or take a screenshot for use out of wifi range. Google maps can supply wonderful information such as where the supermarket is, and whether it is open on Sundays. OSM app: Once installed, one can download entire regions of detailed offline maps and find your position by GPS. Close the app when done looking as it uses battery resources. Airbnb - very useful for bigger towns but requires a couple of days advance planning. Booking.com - more and more chambres d'hotes are using it, and you can check availability instantly. Tip: Go to the hotel website to double-check rates. The price of chambres d'hotes does not necessarily dictate the quality of your night's sleep, more like a rough guide to the standard of the furnishings and breakfast. Average price range €65 (per night, bed and breakfast for two people.) More touristy areas were more expensive, eg. Loire valley, and especially Provence. On our 2014 tour, we stayed in both the cheapest and most expensive ever: €35 and €100 - on consecutive nights! Compostelle routes - We learnt the hard way; a series of pilgrimage routes that all finish at Santiago de Compostela in Northern Spain. They are very popular with walkers, and despite a town seeming to be abundant with accommodation, it would be chock-a-block with 'pellerins' - pilgrims. Keep alert for the main pilgrimage sites along the routes and plan to stay elsewhere or book early. Fete de la Musique - We also got caught by the midsummer music festivals held around France on June 21 - and worse these days - sometimes one day either side - in all large, even medium, towns. Aim for a small place on that date and check the dates if it is around a weekend. Aim to buy your baguette before 12, when everything closes in the country. In the afternoon, we find a supermarket or epicerie (grocery shop) and buy supplies for a picnic supper, so you don't have to climb on your bike again and ride into town for supper. Some chambres have a mini kitchen available, which widens ones shopping options considerably. Many chambres offer tables d'hotes, which must be pre-booked, but it is a more expensive option and the meal starts later in the evening - around the time we like to be readying for bed. Velo routes: Many areas have cycle routes, planned by the local tourist authority, marked with signposts along the way (in theory...) They are planned to follow roads that are both quiet and scenic, ones they have assessed as best for cycling. Maps are available on the internet (provinces and departments have their own tourism websites) and sometimes in the tourist offices. 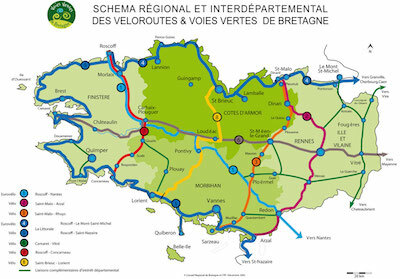 There are also 'voies verts' or greenways, usually old railway lines that have been converted. Although they were easy riding, the views were not as good as the road as trees had grown up alongside when they were still railway lines. 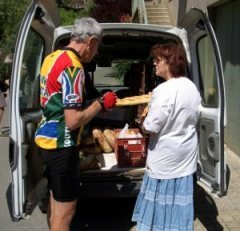 The boulangerie van: In remote or farming areas, you may not find a boulangerie the entire day - but be lucky enough to be hooted at by a boulangerie van, driving through a village. Chase it to where it stops and buy your bread! Smelly cheese: 'Coeur de Lion' meaning 'Heart of the Lion': Very tasty, but once opened, the person carrying it had to ride behind - as the Lion Heart smelled more like a Lion Fart. Pack a small cool-bag to carry perishables, and encompass your cheese in ziplock bags. Stock up on Saturdays. In the countryside in France, most shops (except boulangeries) are closed on Sundays and Mondays (although Mondays are becoming more accessible now).